We fell in love the creative recycled designs of Organelle Design’s repurposed hanger chandeliers years ago, so we were thrilled to see one of their beautiful Hangelier lights on display at the Model Citizens show. 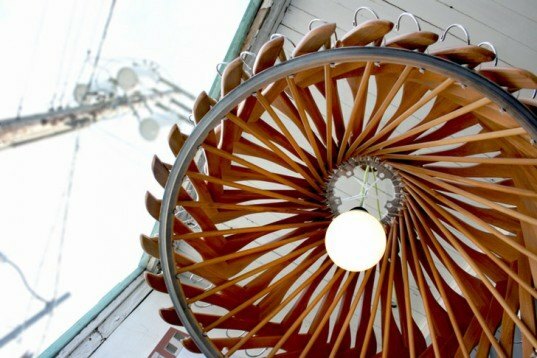 Industrial designers Alex Witko and Courtney Hunt arrange off-the-shelf wooden and plastic clothes hangers in circular patterns, creating mesmerizing eco-friendly light fixtures. Each intricate chandelier is thoughtfully designed, with the hangers placed at different angles to create a variety of shapes and sizes. Every part of the light is made with recycled materials. Bike rims are the main circular structure and zip ties and chain rings attach the hangers to the metal. The materials may be mundane, but when put together by Organelle, the result is a stunning, one-of-a-kind chandelier that will brighten any dining room. We fell in love the creative recycled designs of Organelle Design's repurposed hanger chandeliers years ago, so we were thrilled to see one of their beautiful Hangelier lights on display at the Model Citizens show. 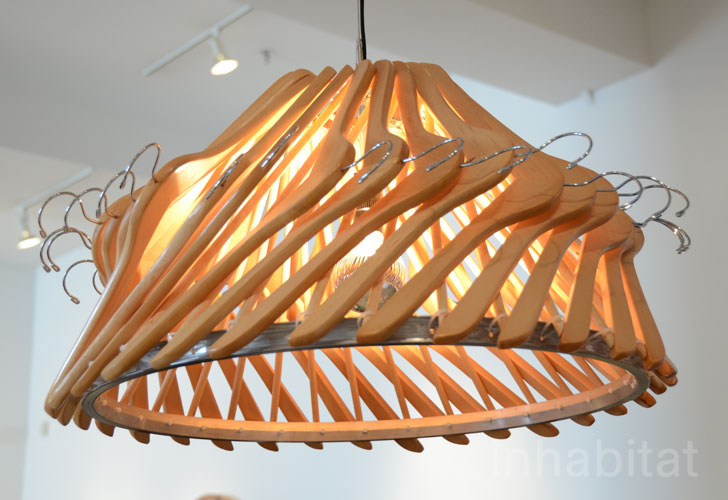 Industrial designers Alex Witko and Courtney Hunt arrange off-the-shelf wooden and plastic clothes hangers in circular patterns, creating mesmerizing eco-friendly light fixtures.